More than 8,000 BC Hydro customers are without electricity after a winter storm swept across Vancouver Island. The company reported 4,700 customers on southern Vancouver Island were in the dark Tuesday morning, while more than 3,300 customers in central and northern Vancouver Island were impacted. A tree down on power lines cut power to 640 customers in Central and North Saanich. 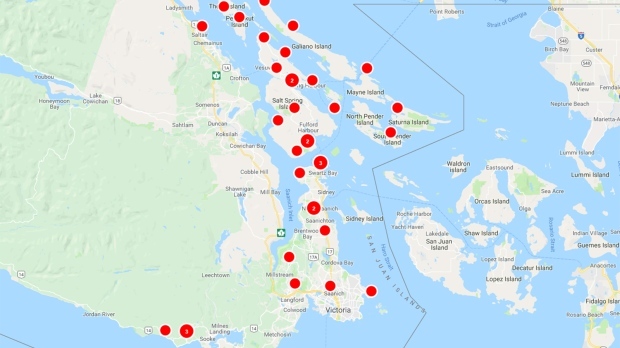 Another 1,253 were without power on Salt Spring and Pender Island. Other outages occurred in Oak Bay, Saanich, multiple West Shore communities, Duncan and Galiano Island. Further north, nearly 3,100 customers in Qualicum Beach were waiting for their electricity to be restored. In Nanaimo, outages were affected more than 200 homes. BC Hydro said crews were either assigned or were on the way to most of the outages on Vancouver Island.